Welcome to your best resource to find the right attorney for your legal needs. The LRS is certified by the State Bar of California (California State Bar Certification ##0027) and meets lawyer referral standards set forth by the American Bar Association which require all LRS attorneys to carry malpractice insurance. The Lawyer Referral Service (LRS) of the North County Bar Association is Northern San Diego County’s leading lawyer referral service, providing the community with free referrals to experienced attorneys licensed to practice law by the State Bar of California. 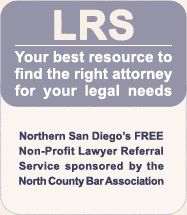 Founded in 1982 by a group of Northern San Diego County attorneys, the LRS is a non-profit organization comprised of more than 100 North County-based attorneys. A total of 17 different areas of the law are represented in the LRS, and all attorneys members are licensed, insured, and in good standing with the State Bar of California. Attorneys admitted into the LRS program must have demonstrated experience in a particular area of the law and be engaged in the practice of law in Northern San Diego County. How does the LRS work? LRS counselors are not lawyers and, therefore, cannot give legal advice over the phone. Callers are matched with an attorney who not only best fits the legal case at hand, but who also is within your geographical area. Those contacting the LRS are instructed to call the referred attorney’s office to receive a free, 30-minute consultation and discuss their legal issue and fees. The first 30 minute phone consultation or in-office meeting with the lawyer is free. To assist our counselors, please summarize your legal problem. You will then be provided with the name and telephone number of a member attorney experienced in the appropriate area of law. Our office hours are between 8:30 a.m. – 5:00 p.m., Monday through Friday. All communication is held in the strictest confidence. You are under no obligation to hire the attorney to whom you are referred.